Stunning diamond stud earrings. Each diamond is shown with 70 points with total weight of 1.40 carats. 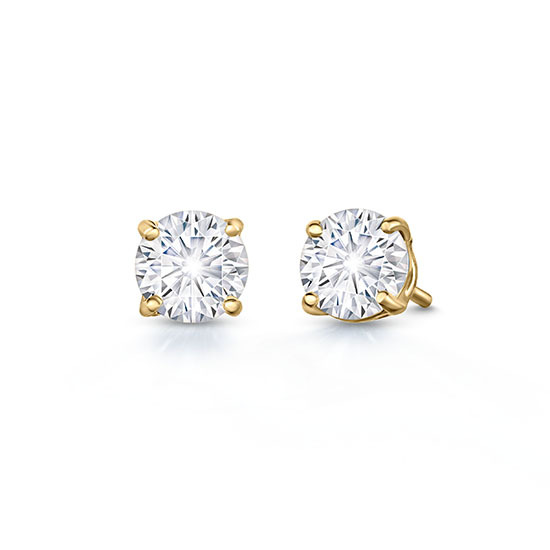 Our Diamond Stud Earrings are available in 18k Rose Gold, 18k Yellow Gold and Platinum, and can be custom ordered to your desired carat weight. Our 1.40 carat diamond studs are available to purchase in platinum and 18k yellow gold with perfectly matched 0.70 carat G Color VS2 Clarity Round Brilliant Cut Diamonds, and in 18k rose gold with perfectly matched H Color SI1 Clarity Round Brilliant Cut Diamonds. Also available in platinum with 1.64 carats in total, with perfectly matched F Color VVS1 Clarity Round Brilliant Cut 0.83 and 0.81 carat diamonds. Each setting has been custom designed to fit the exact proportion of the diamond. Email [email protected] or call 212.566.8977 for custom orders. Ships In: 1-2 weeks. For custom orders, please allow 4-6 weeks.